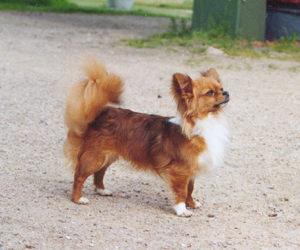 Tiddy's Nutshell was World Winner and Best Female at World Winner Show in Dortmund 2003, beautifully handled by Henrik Larsen, Pequeno chihuahuas, Denmark. BEST IN SHOW at Danish Toy Dog Club July 2003. Judge for BIS was Mrs Maureen Boyd, New Zealand. Judge for BOB was Mr Terry Nethercott, GB. Second picture when winning open class at World Winner Show in Amsterdam 2002, handled by Henrik Larsen.